So at the end it came down to two limit champions from this year, Marc Naalden, only the second ever Dutch Bracelet winner and Greg Mueller, who won the Championship $10,000 Limit event. Both players were early chip leaders and the heads up battle swung both ways with Naalden having whittled Mueller down to about 1,000,000 at one point. 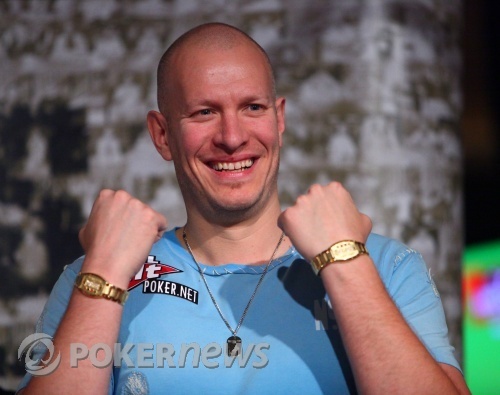 But despite a loud and vociferous Dutch rail, Mueller redoubled his efforts and managed to recover to claim his second bracelet of the series. 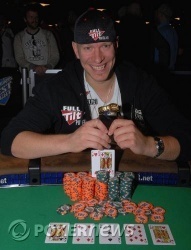 Congratulations to Greg Mueller, double bracelet winner and winner of Event #50! Marc Naalden raised from the button, and Greg Mueller called. The flop came . Mueller checked, Naalden bet, and Mueller called. The turn was the . Mueller checked again, Naalden bet, Mueller check-raised (to 160,000), Naalden reraised all in with the last of his chips, and Mueller called. Both turned a pair of kings, but Mueller's five-kicker gave him the advantage. The river brought the , giving Mueller the hand and the last of Naalden's chips. Marc Naalden is our runner-up, and Greg "FBT" Mueller is our Event No. 50 Champion! That's his second WSOP bracelet of the series, making him the fourth multiple-bracelet winner this summer. Marc Naalden raised from the button, and Greg Mueller called. The flop came . Mueller checked, Naalden bet, and Mueller called. The turn was the , and both checked. The river brought the . This time Mueller bet, and Naalden folded. Those stacks of orange (5000) and green (25000) chips in front of Mueller are getting higher and higher. He's now at 3.1 million to Naalden's 500,000. Greg Mueller raised from the button, and Marc Naalden called. The flop came . Naalden bet, and Mueller called. The turn was the , and Naalden again bet, and Mueller again called. The river was the . Once again, Mueller called Naalden's bet. Naalden showed -- busted straight and flush draws -- and Mueller for sixes. On a flop of , Greg Mueller bet and Naalden called. Both checked the turn. The river was the and Mueller bet. Naalden thought a bit, then called. Mueller showed for ace-high -- and it was enough, as Naadlen mucked. Mueller gets a few more there, and is up to 2.7 million to Naalden's 900,000. Most hands are ending on the flop here for the last ten minutes or so. One exception was a hand in which the pair checked a flop and turn. Mueller then bet the river, and Naalden mucked. Mueller is up to 2.5 million now, and Naalden at 1.1 million. Greg Mueller just took a couple more pots to push out a little further. 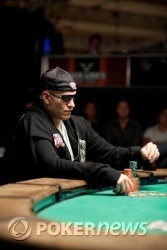 He now has a 2-1 chip lead over Marc Naalden, with 2.4 million to Naalden's 1.2 million. 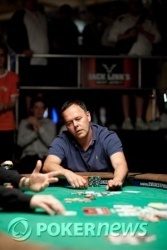 Before the flop, Greg Mueller raised, Marc Naalden three-bet, Mueller made it four bets, and Naalden called. The flop came . Naalden checked, Mueller bet, and Naalden called. The turn was the . Again, Naadlen check-called Mueller. The river brought the . Naalden checked, Mueller bet, and Naalden folded. Mueller is up to 2 million, and Naalden at 1.6 million. Mueller's gets it to four bets preflop and Naalden has made it three bets. Naalden check-raises the flop before bet-calling a raise from Mueller on the turn. On the river, Naalden bets again and Mueller raises once more. Naalden makes the call with but loses out to Mueller's . Mueller pulls back in front with a slight lead with that one.